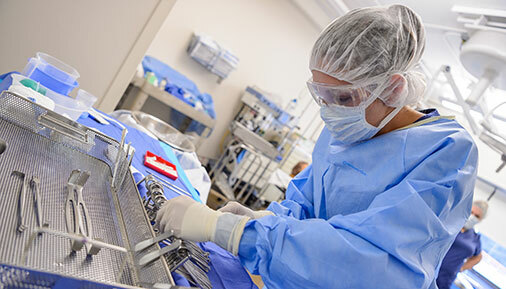 Hudson Valley Community College's Surgical Technology associate degree program is now offered in a new accelerated format, which has been approved by the State University of New York. Students in the degree program will study straight through four consecutive semesters – fall, spring, summer and fall – and complete the 64-credit degree in 16 months. The college also offers a 46-credit Surgical Technology certificate program, which is ideal for those who are already in the field of surgical technology who are looking for an accredited program to gain certification. Both certificate and degree are the only programs of their kind in the region. The college established the programs in 2015 in response to a state law that mandated that all new surgical technologists graduate from an accredited program before pursuing their licensing exam. Successful graduates are eligible to take the Certified Surgical Technology exam through the National Board of Surgical Technology and Surgical Assisting (NBSTSA). Surgical technologists prepare operating rooms, arrange equipment and help surgeons during a range of surgical procedures. They also are responsible for ensuring aseptic conditions in the operating room, as well as cleaning and preparing all instruments that might be needed in an operation. The program is housed in the college's Nursing Department. For more information, contact the college's Admissions Office, (518) 629-7309. Founded in 1953, Hudson Valley Community College offers more than 85 degree and certificate programs in four schools: Business; Engineering and Industrial Technologies; Health Science; and Liberal Arts and Sciences; and an Educational Opportunity Center for academic and career training. One of 30 community colleges in the State University of New York system, it has an enrollment of nearly 11,500 students and is known as a leader in distance learning initiatives and workforce training. Hudson Valley has more than 75,000 alumni.